Since mornings can be pretty hectic, making my lunch the day before really does make a difference and is great for time saving. I love this very simple and pretty way of having a delicious and portable homemade salad – you can layer it up with whatever you fancy and the above is just one example. 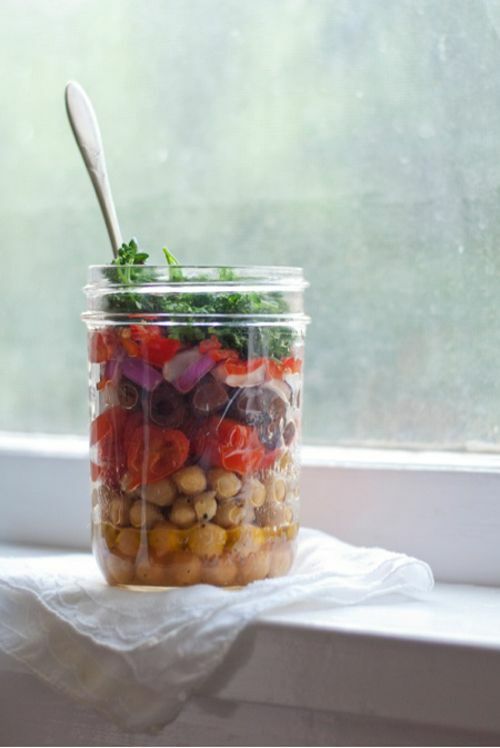 The trick is to put your dressing in the jar first and then pack all your layers down tightly so the dressing doesn’t flow everywhere and come into contact with most of your veggies (salad leaves tend to go limp and floppy if they’re dressed too early) until you’re ready to eat it. When you’re ready to serve, just shake it up (think Tom Cruise in Cocktail) and you’ll have a perfectly dressed fresh salad. Bam. Here is one of my favourite salads (it’s not the one in the pic). Don’t forget – dressing in first, then layer up in the order of the recipe.. But where’s my penguin biscuit?